Axial piston pumps are widely used throughout the mobile and industrial sectors. They are generally the pump of choice for flows over 5L/min and up to 415 bar, if budgets allow. In general, the swash plate design is used for pumps and the bent axis design for motors although there are applications where this is not the best solution. The duty life can be as high as 10000 hrs, full load operation, which makes them ideal for continuous duty industrial power units and heavy-duty mobile applications. Manufacturers tend to have a range of different pumps available that are tailored to suit the cost and duty of different industrial sectors. It's difficult to give exact pressure ranges etc as there are so many different versions available. Supplier experts will always advise on specific applications but this training is to make you aware of the important areas so that you better understand and can, therefore, diagnose issues with your equipment. Essentially axial piston pumps are used on high-performance equipment, typically heavy duty industrial, continuous operation, high pressure 315 bar and above. Mobile excavators and wheel drive systems. Lower cost versions have been produced in recent years and because of their high-performance, duty rating and clean operation, they have become more widely used. 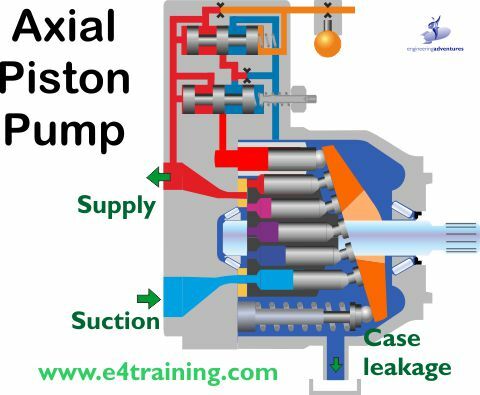 Axial piston pumps typically have 9 pistons that rotate around a central drive shaft. 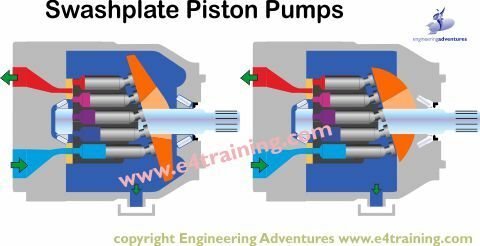 As the pistons rotate they move against a swashplate or bent axis which forces them to move up and down along the pump axis. As the pistons retract they allow fluid, under the reservoir pressure head, to fill the increasing volume. As the pistons pass top dead centre, the suction port is closed and the pressure port opens so that the extending cylinders can push the fluid out. In variable displacement pumps the swash plate, or angle of the bent axis is changed. As the angle reduces the stroke of the piston reduces and therefore the output flow reduces to. One of their main benefits is that piston pumps do not have any contacting parts. If hydraulic equipment can always work with a hydrodynamic fluid film between it's moving parts then metal to metal contact is avoided and in theory, the units will last forever. There have been many different designs of piston pump, each to satisfy different markets or machine requirements. While most of these have been very good, Rexroth has dominated the market with their products for many years. This is not necessarily because their pumps perform better but that they certainly perform as well as is required and for the lowest price. One of their key advantages has been the technology to successfully bond the CuNi faces to a steel slipper. And by funding development in manufacturing and design from high sales into the mobile division, Rexroth has been able to provide reasonably priced, uprated versions for the industrial markets. Although they perform identical functions there can be significant differences between mobile and industrial pumps. Cost is critical in mobile applications so component sizes are kept to a minimum. Pressure controller loses are also kept to a minimum to reduce fuel consumption, but because vehicle numbers are high the manufacturers have time to test and confirm that everything is sufficient. For industrial applications, the manufactures can only offer one pump to satisfy all conditions so pump control pressures and bearings need to be sufficient to satisfy the toughest duty they are specified to meet. Different features and performance characteristics are required for different machines so you will see a range of different pump types used in different markets. For example the Parker 'Gold Cup' has been around for many years and because of its robust design is ideally suited to marine hydroplanes, where it has a proven history of performance and life, however, its size and price, limit its use in other applications. In the same way, the internal mechanics of bent axis piston pumps makes them, in general, more suitable for motor applications than pumps, and swashplate designs more suitable for pumps than motors. Although bent axis designs will work well as both. Swashplate faces require an exceptional quality of finish to operate efficiently. Any damage may not be visible to the naked eye, so if you can see grooves or damage then you've definitely got a problem. I have been confidently informed by service engineers that re-working with the finest flour paper can redress light damage although, manufacturers will say you can't (unless perhaps you are very lucky). Suction and case pressures are critical. Piston slippers, used in swashplate pumps, are a key area of the design that determines the maximum performance limits. The internal piston pressure feeds through to lubricate the bearing face so if the suction pressure is too low, or case pressure too high, then the fluid film can break down and metal contact occur. Excessive speed or supply pressure peaks or gradients can also cause 'bouncing', leading to early pump failure. Look for wear on the edges of the slippers or slipper faces. Bent axis designs tend to have balls instead of slippers. This will allow them to run at higher speeds as they don't rely on the pressure to keep them in contact with the swashplate. If pumps over-speed or fluid quality is damaged then the first signs you may see are markings or dis-colouring on the sides of the pistons. Once damage has started inside a piston pump this can accelerate quickly and lead to catastrophic failure. The only solution is to replace the complete rotary group. Always make sure piston pumps have fully primed suction lines and cases, before start-up. Always check the electric motor direction is correct before starting as incorrect running will damage most pumps. Piston design - Solid, hollow, or with piston rings. The design and weight of the pistons will have a major effect on pump efficiency. The Parker F11 design with its lightweight head and retained balls can reach significantly higher speeds than swashplate pumps with their longer, heavier pistons. 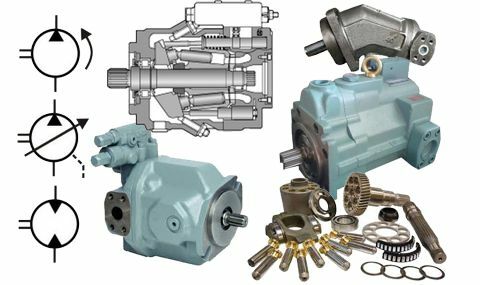 Some pumps and motors can run over-centre, which means they can provide flow or rotate their drive shaft in both directions. These are commonly used in closed circuit, mobile vehicle drives systems. Bent axis designs tend to have much heavier duty shaft bearings than swashplate pumps. This is because they are more commonly used as motor drive units and have to take the wheel loads against their shaft. Swashplate pumps, on the other hand, tend to be driven through flexible couplings that will remove any side loads, so the internal bearing is sized just to take the internal loads from the dynamic and pressure loading forces. Noise level can be an issue with piston pumps. The noise is generated by the discontinuities in the flow e.g. as the pistons move forward and backward they create a pulsating flow that passes into the complete hydraulic system and vibrates or radiates from other components further down the circuit. This flow discontinuity is further complicated by the supply port which connects and disconnects each piston as it rotates. The timing of the opening and closing can create other, higher frequency flow discontinuities. Often different timing plates are available for different operating conditions e.g. fixed speed or variable speed applications. Case leakage line pressures are critical for controlling the pressure balance of the slipper against the suction pressure. Care should be taken with some pump controllers as the valves exhaust into the pump casing and can create dangerous pressure spikes. Make sure case drain lines are sufficiently sized. One possible solution may be to use a more compliant, clear plastic hose for the case leakage line which will have the effect of damping out these peaks before damage the slippers. Case leakage line temperatures are also a good way of monitoring the health of the pump as discussed in the vane pump section. If you are in doubt about the most appropriate pump to use in your application then always talk to manufacture or distributor who should be able to offer the most appropriate pump range and advise the expected service life. Consider using bearing flushing to improve control of pump casing temperatures and pressures. This will be specified by the manufacturer under some conditions and may be beneficial for other high duty running conditions. Check the bearing life calculation using the manufacturer's values and formulas, or ask the supplier to get these for you. We haven't mentioned the different types of pump controller here, but they are provided in a later section.